When shopping for pallet rack, buyers may find options in the market that, on the surface, seem quite similar, but a savvy buyer will find that with all that is riding on a pallet rack decision, doing one’s homework up front can pay dividends in the end. From the warehouse environment to the steel gauge to the “recipe” of the steel itself, the true cost of a pallet rack over the life of the system can be difficult to determine. While the dimensions of the rack components certainly contribute to a rack’s capacity rating, many factors can adversely affect its performance and long-term cost. “It is all about price – pay upon initial purchase or pay much more later to upgrade a sub-standard system to meet requirements,” according to Raymond Weber, Eastern Regional Manager at Steel King. The dimensions and gauge of steel are not the only measures of rack quality. When comparing two seemingly identical rack systems, for example 3-inch columns of the same gauge of steel, there can be profound capacity differences that can lead to frequent repair/replace situations. How much bracing is designed into the system? Inadequate bracing will affect both capacity and impact resistance. How much weld surface connects your uprights and braces? Frames are only as impact resistant as the welds that hold them. Are upright columns a fully closed tube design or the common open-back configuration? A closed tubular column can withstand far more impact. 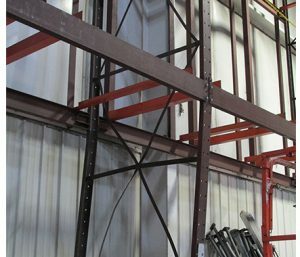 “Steel King’s SK2000 roll-form pallet rack system is designed with a closed tubular design throughout – uprights, beams and bracing, giving the rack a 250% increase in front-impact strength and 68% increase in the side-impact strength when compared to common open-back systems,” according to Weber. “This leads to a reduction in damage in the event of a collision and a far less likelihood of rack collapse and product loss or worker harm,” Weber adds. Once a load bearing component of a rack has been damaged, its capacity is reduced, increasing risk. Since replacement parts and labor often cost far more than parts in the original rack system, a lower-cost rack will often require large investments in maintenance and repair. And it’s not just the cost of the repair itself. “Workflow disruption and downtime during rack replacement is a cost that few companies take into account when assessing the cost of rack, but it’s a very quantifiable budget item,” says Weber. Not all steel is alike, and there can be considerable differences in strength. Steel is an alloy of iron and carbon, with the flexibility of having other elements “alloyed” into it. Steel made in the U.S. is carefully regulated and will have mill certification that it’s been manufactured using the correct mix of metals for optimal performance. Imported steel does not carry that same certification and assurance, and can often contain other elements or contaminants that diminish strength. While all rack applications run the risk of collision or improper loading, some warehouse environments cause even greater wear and tear on rack systems. Cold storage applications can be particularly brutal. Food and pharmaceutical inventories are time-sensitive. Products are moved through and the stock is rotating far more frequently than other products, making these facilities high traffic areas. To reduce the cost of refrigeration, facilities opt for denser product storage, and fork trucks have to navigate narrower aisles, increasing the chance of collisions. Cold storage facilities are harsh work environments for workers as well. Bundled in cold- weather gear, drivers operating in 0-55°F facilities are often in a hurry to get in and get out, which can also affect their level of precision. In addition, the slippery conditions of blast freezers can contribute to the vulnerability of racking. Since a pallet rack is classified as a building element, it therefore must be permitted as such. 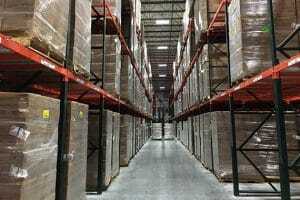 Increasingly, building codes require that pallet racks meet seismic standards. In practical terms, this means that pallet rack systems must be strong and durable enough to withstand seismic forces. Pallet rack systems built from “stock” components often do not meet these rigorous building codes. High-quality racking can be customized and built to meet the load rating capacity to withstand tremors. Thoroughly researching the applicable codes and permitting requirements in your municipality ahead of time can save a lot of cost and headache. When evaluating the purchase of a pallet rack system, it’s important to look for the hidden costs that can dramatically increase the Total Cost of Ownership (TCO) over the lifetime of the rack. Making sure that the purchased system can endure the environment for which it’s intended can far exceed the initial investment in terms of safety, maintenance and operation costs. Since forklift impact is inevitable and under-reported, rack systems should be inspected regularly, and maintenance performed promptly, in order to mitigate dangers and keep large-scale maintenance costs low. A reputable rack design firm will also take into consideration the storage environment and work flow. 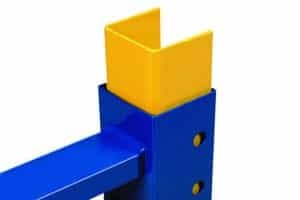 By installing options such as oversized base plates, reinforced columns where rack may be impact-susceptible, a majority of serious damage can be prevented upfront. An investment in post protectors, end of row guards, safety guard rail, or other accessories will also contribute to the long-term durability and cost savings of your pallet rack system. “Ultimately, even though they may cost more up front, pallet rack systems that are built better from the beginning can save on costs throughout the lifetime of a pallet rack system,” says Weber.